Kanair FORCE is especially manufactured for the agricultural and forestry machineries like skidders, fellers bunchers, loaders, harvester, tractors and all equipment for field-work. Our reinforced inner tube protects your vehicle against puncture. Its greater thickness ensures an optimal resistance and increases the durability of product. They are usually fit out with TR218A screwed valve which facilitate air or water ballast use. Besides these technical advantages, our strengthened tube has economical aspect: it makes montage, fit and removal easier to win time and you can reuse it! 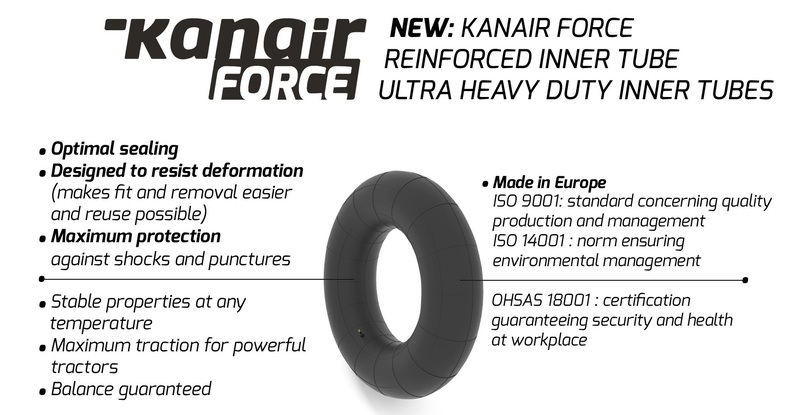 Each Kanair FORCE tube dimension can cover many tyre sizes. It’s delivered inside it custom made solid cardboard packaging to ensure the safety of the product during the transportation and to ease storage. 2018 : TWO NEW PRODUCTS !!! !